MPLAB® Harmony is a flexible firmware development platform for PIC32 microcontrollers. This integrated software framework provides driver libraries and APIs that make it easier for you to use PIC32 peripherals (Timers, GPIO, UART, I2C, SPI, etc.). It also includes middleware libraries for USB (Host and Device), TCP/IP (Ethernet and WiFi®), Graphics, Bluetooth, and others. On the press of a button, capture the image which is displayed on the Graphical LCD and store it on the SD Card. Host an onboard web server to display the photos (stored on the SD Card) on your computer's web browser. The MEB II board connects to LAN via Ethernet. You will use MHC to configure the Harmony TCP/IP stack. Enable the board to display its IP address on the console. Use the provided source files and step-by-step instructions below. Just build the solution project and download it to the MEB II Board to observe the expected behavior. Create an MPLAB X IDE Harmony project for a PIC32 microcontroller from scratch. Use the MPLAB Harmony Configurator (MHC) to configure and generate Harmony code. Demonstrate the use of Harmony peripheral libraries and drivers to control PIC32 peripherals (SPI, I2C, Camera, Timers etc.). It is not necessary to have an MPLAB Real ICE™ to program/debug the code. The PIC32MZ EF Starter Kit includes a PICkit™ on-board (PKOB) debugger. The PKOB debugger can be connected to a host PC through the USB mini-B connector on the PIC32MZ EF Starter Kit for programming/debugging (See the Red Cable in the Hardware Setup). In addition to the hardware shown above, you'll also need an Ethernet cable and two USB (mini-B) cables. 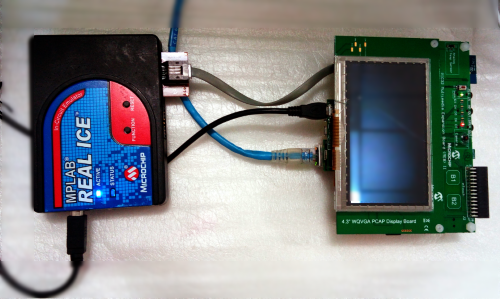 This lab application allows capturing an image using the camera module on the MEB-II board. The captured image is stored on an external SD Card. The external SD Card hosts a FAT32 file system. The captured image stored on the SD Card can be viewed as a slideshow on a web page hosted by the web server running on the development board. The application runs a DHCP client on the target. The target board receives its IP address from the DHCP server which runs on the router to which the target is connected. The image format supported is BMP. The application also supports the plug and play feature for SD Card media. The live photo frame application runs as a single application task in the App_Tasks() function. APP_Tasks handles the application related states and events. The tasks sequentially progress through the following steps. Register an application callback with the filesystem service. Wait for the SD Card to be mounted. 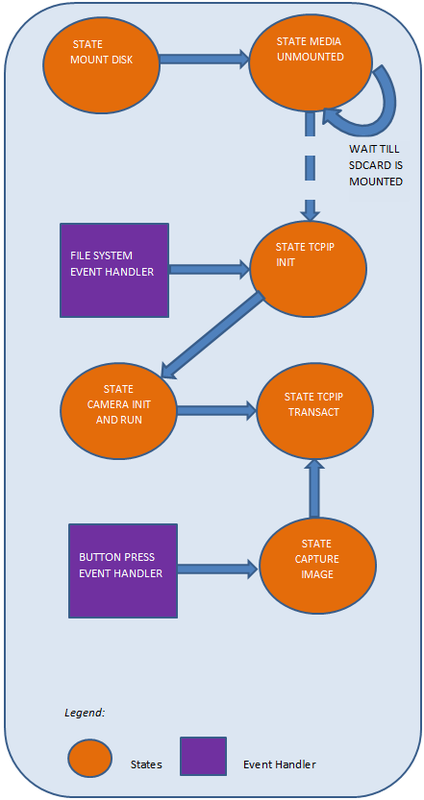 The application state moves to TCP/IP stack initialization once the SD Card is mounted. The application initializes the TCP/IP stack. Once the TCP/IP stack is ready, the application moves to the next state. Initialize and start the camera module. The application switch is pressed to capture the image on the camera module. Capture image on camera module to SD Card on a "button press" event and get back to step 6. This ZIP file contains the completed solution project for this lab. It also contains the source files needed to perform the labs, as per the following step-by-step instructions (see the "Procedure" section on this page). If this is not done, MPLAB X IDE will not be able to find all source files for the lab solution and the solution project will not build successfully. live_photoframe contains the lab folder live_photoframe_lab. live_photoframe_lab contains the lab solution (in the firmware folder) and source files (in the dev_files folder). dev_files contains application source files and other support files (if any) required to perform the lab (see "Procedure" section below). firmware contains the completed lab solution project. It can be directly built and downloaded on the hardware to observe the expected behavior. All steps must be completed before you are ready to build, download, and run the application. You should be able to view the images that you captured using the camera module on your computer's screen using a web browser. In this tutorial, you developed a WEB enabled live photo frame that captured and stored the image on the camera module to an SD Card connected over an SPI interface. You used the MPLAB Harmony Configurator (MHC) to select the appropriate Board Support Package (BSP) and configured the clock system, TCP/IP stack, timer driver, camera driver, output compare driver, and file system. You configured an application switch to capture an image on a button press event. With this tutorial, we demonstrated how easy it is to add a web server and image capture functionality to your application. The lab shows how you can create complex applications that integrate various peripheral drivers, device drivers for Display, TCP/IP, File System etc., through the use of the MPLAB Harmony Configurator (MHC).